I made a break through in Korean just now and had to share. I still feel like a clumsy ogre when I speak out loud. but I realized I was drawing the syllables out to long and the breathe holding trick only worked to a point, and well it also made me look foolish lol. I especially started having problems when I had the bright idea to learn the lyrics to my favorite songs as a way to improve vocab, pronunciation, and speed. It was a major fail. Forget getting to the translating part of the ride, every sentence felt like the cruelest tongue twister ever. I've drilled the syllables over and over again, so why couldn't I string them together when need to, *sigh* so frustrating. I started snapping my fingers out of annoyance to hurry myself along I guess and surprise surprise I got through the sentence. The light bulb dinged on above my head and Shazam lol! 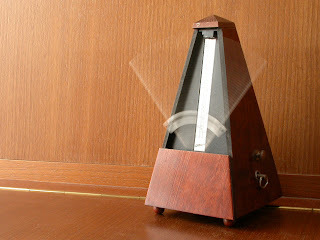 I raced to my computer to find a Internet metronome to try. It took a bit of experimenting but so far I've had the best results with 70 bpm, adagio, 4 beats per cycle, beat 1 accented. I breezed through to the first chorus using this method.